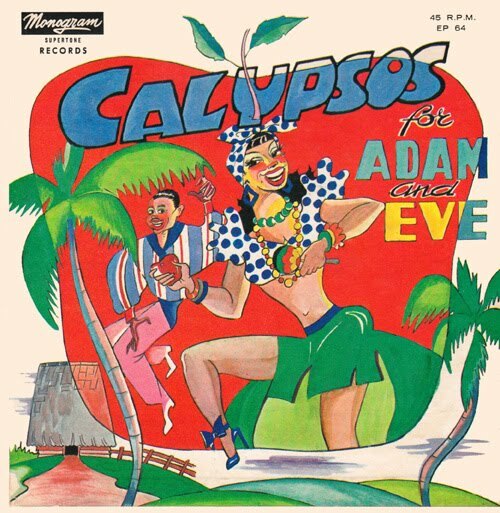 This vivacious tropical cover for the Monogram label (disc: Kalypso Records Ltd., Jamaica) appears to be the handiwork of the same uncredited artist who illustrated Ritmo's Calypsos from Jamaica. The above 7" EP features tracks by the Duke of Iron ("Big Bamboo"), Lord Kitchener ("Big Toe"), the Four Deuces ("Lemme Go Emelda"), and Sir George Brown ("He Like It, She Like It"). The A-sides, with Kitch and Duke of Iron, are classic Trinidad calypso, while the artists on side B reflect the Jamaican mento variant. We would appreciate any information about the illustrator, whose style is audacious and singular.